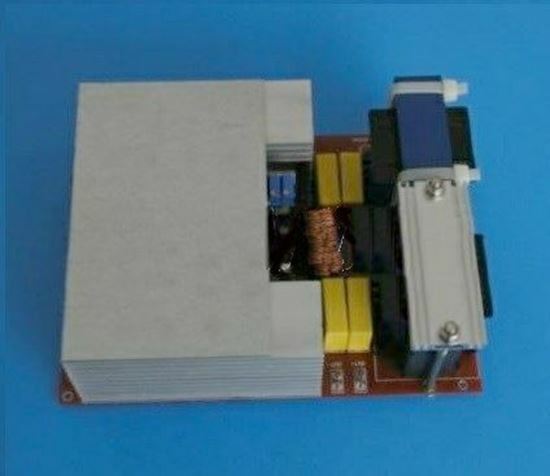 Ultrasonic generator for Bolt Clamped Langevin Transducers with fixed 200W output power and fixed 40KHz frequency. This generator must be attached to 4 units of Langevin Transducer SMBLTD45F40H connected in Parallel. The Positive electrode on the transducer is the one between the two piezo ceramic rings. All transducers should be connected in parallel using the correct polarity. Positive and Negative wires coming from the transducer will connect to the Positive and Negative output connectors on the generator shown at the top left on the above drawing. => GENERATOR MUST HAVE A COOLING FAN BLOWING AIR ON ITS HEAT SINKS AND ELECTRONICS. We suggest two fans for protection redundancy. => NEVER TOUCH THE TRANSDUCERS OR THE GENERATOR WHEN IT IS POWERED. => YOU SHOULD NOT PUT YOUR HANDS INSIDE OF THE ULTRASONIC TANK WHILE IT IS ON. THIS MAY DAMAGE YOUR HAND’S TISSUE.